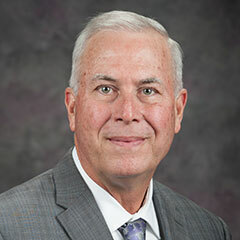 Gary Clark, senior associate dean for the College of Engineering, and professor of biological and agricultural engineering at Kansas State University, has been named the 2017 Engineer of the Year by the Kansas Society of Professional Engineers. The presentation was made at an awards luncheon, June 15, at the society's annual meeting in Lawrence. Clark was recognized for his "diligence and integrity as a professional engineer, and dedication to a better way of life for mankind." In March 2017, Clark had been named Engineer of the Year by the Tri-Valley Chapter of the Kansas Society of Professional Engineers. A state society of the National Society of Professional Engineers, the mission of the Kansas organization is to promote, recognize and enhance the engineering profession by delivering professional development products and services, encouraging licensure, and advocating legislation and public policy for the betterment of human welfare and the profession.